This 12"x 18" Gadsden Garden Flag is made from durable, outdoor nylon material with a vertical layout and pole sleeve top to fit any garden pole. 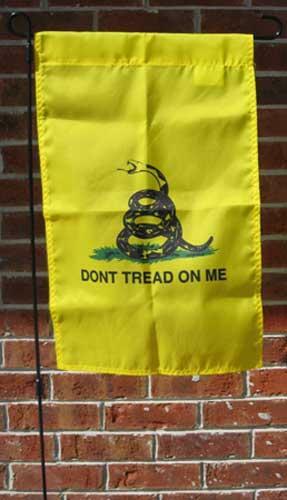 The image is dyed into the nylon fabric to promote a long-lasting and vibrant looking Don't Tread on Me rattlesnake flag. The Gadsden flag is associated with Christopher Gadsden, who was a delegate to the Second Continental Congress. He presented a flag to the Provincial Congress of South Carolina on Friday, February 9, 1776. The journal of the South Carolina congress describes the flag as "an elegant standard, such as is said to be used by the commander-in-chief of the American navy; being a yellow field, with a lively representation of a rattlesnake in the middle, in the attitude of going to strike, and these words underneath, 'DONT TREAD ON ME!'"